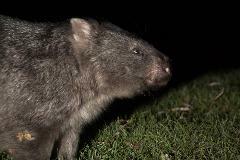 Evening night walks and spotlighting in Healesville, to see Australia's largest gliding marsupial. Less than an hour from Melbourne are the rainforests of the Dandenongs and Yarra Ranges. This private guided tour is strictly limited to two people. After lunch (own expense), you'll take a walk in Mountain Ash forest, the tallest flowering plant in the world, where Superb Lyrebirds mimic other birds and Australia's native mammals dwell. Late afternoon, we'll head to a secret location to look for wild Platypus (they are very commonly seen) and, if you're lucky, stumble across the resplendent resident Lyrebirds at Badger Weir. A night-time stroll, under spotlight in the dead of night, will let us search for one of Melbourne's most endearing and secretive native animals - the Greater Glider. Although no wildlife sightings can ever be guaranteed, during this trip you have a very good chance of seeing Platypus, Wombat, Swamp Wallaby, Superb Lyrebird (seasonal) and Greater Glider, as well as a suite of rainforest birds. You might see Sugar Glider, Yellow-bellied Glider and Mountain Brushtail Possum during spotlighting and you will may hear Sooty Owl, Powerful Owl and Southern Boobook.